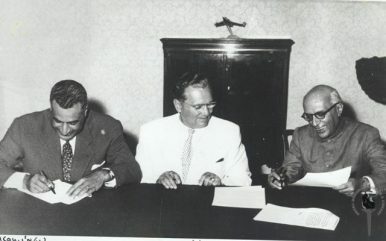 Nehru at the Conference of Non-Aligned Nations held in Belgrade September 1961 with Nasser and Tito. India has evolved from a protest voice on the world stage to an active shaper of the international order. The recent India-Pakistan crisis, while once again raising the specter of war in South Asia, also highlighted that the likes of France, Germany, Australia, and the United States are willing to stand behind India in the international arena. In Pakistan, most believe that this is because of India’s economic heft and the size of its market. This view lacks depth and ignores the fact that the evolution of India’s strategic outlook has led the country to go from being a protest voice on the international stage to a nation-state that is actively shaping the international order. Following independence, India’s strategic outlook was shaped by Jawaharlal Nehru, who viewed the West with skepticism and had a rosy view of socialist ideals. This led to foreign policy that was built on three key pillars: nonalignment in the international arena; preservation of autonomy in domestic affairs; and solidarity among developing nations, particularly those that had recently gained independence from colonial powers. This policy continued throughout the Cold War, when India leaned toward the Soviet Union while deftly maintaining strategic autonomy and charting its own course in a bipolar international order. This worldview began to evolve following the collapse of the Soviet Union and an economic crisis at home. India slowly opened its economy through careful economic liberalization that signaled the end of the license raj, and at the same time began to engage with the rest of a world on a different set of norms. A newfound pragmatism began to emerge and by the late 1990s India was willing to place its own national interest – both economic and security – ahead of broader ideas of global justice and equity. The high rates of economic growth ushered through domestic reforms attracted international investors and India’s strategic thinkers quickly captured this opportunity. Economic attractiveness gave the country space to engage the rest of the world on its own terms. This meant that India would not give in easily on strategic issues, but it would at the same time be flexible and engage with the rest of a world to achieve win-win outcomes. As India’s economy continued to grow and the country engaged with the rest of the world on a more equal footing, India underwent a third evolution in the country’s strategic outlook. This shift, which is ongoing today, seeks to position India among the great powers by showcasing a willingness to take on more international responsibilities. India is taking on these responsibilities to achieve the holy grail in the international order: a permanent seat at the United Nations Security Council. Narendra Modi’s rise to power accelerated this shift, as he sought to not only push India to be a global leader, but to also secure his legacy as a transformative prime minister whose stature would rival some of India’s greatest political leaders. In the last four years under Modi, India has sought to play a greater role in solving global challenges and shaping the rules, norms, and processes that guide these efforts. Three emerging shifts in the international order have played a key role in catalyzing India’s rising stature in the international order: terrorism, climate change, and the rise of China. In the post-9/11 world, terrorism became unacceptable, particularly when it was used as a tool by nation-states to achieve strategic goals. India, buoyed by its growing economic engagement with the rest of the world, captured this opportunity to target Pakistan at a time when Islamabad was unable, and at times unwilling, to rein in terror organizations operating on its soil. At the same time India engaged with the rest of the world, including China, and made bold commitments to combat climate change. In 2016, India announced that all countries should make legally binding commitments to meet key climate change goals – a major shift in policy – and then quickly ratified the Paris Agreement, drawing worldwide accolades for its goal of installing clean energy capacity that would equal 40 percent of the country’s total energy capacity by 2030. The emerging geopolitical environment, where a rising China is being viewed as a strategic competitor by the United States and its allies, allowed India to position itself as a nation-state that could play a pivotal role in balancing against China. This enabled growing U.S.-India strategic ties, as well as close ties with countries like Japan, Australia, and France. Throughout this period, Pakistan’s strategic outlook and policy remained static: the country largely failed to convince the rest of the world that it was putting its house in order; talking points that Pakistan was itself a victim of terrorism became stale; and Pakistan was unable to credibly demonstrate to the rest of the world, particularly Western powers, that Pakistan had abandoned its policy of using proxies to achieve strategic objectives. Economically, Pakistan also remained a risk that needed to be managed – no one wants an economic meltdown in a nuclear-armed nation with over 200 million people. The country’s reliance on bailouts from the IMF and handouts from allies has been in stark contrast to India, which has been viewed by the world, including Pakistan’s closes allies, as an attractive market. As the international order undergoes significant changes, India’s policy continues to evolve while Pakistan’s remains largely static. This explains why the rest of the world stood behind India in the most recent crisis, and odds are that it will continue to stand behind India in future crises. Pakistan will continue to find itself isolated in the international arena until it reconsiders its strategic outlook and policies, and credibly demonstrates that its policies are evolving to align with the interests of the community of nations. Uzair Younus is a Director at Albright Stonebridge Group. Views expressed are his own. India for the most part has shed its aversion to power politics. The Democratization of India's Foreign PolicyThe Pakistan Factor in the 2019 Indian General ElectionsWhat Trump's Iran Decision Means for IndiaReimagining India's Nordic TiesWhy Did Nehru Want the People’s Republic of China in the United Nations?